If its Tuesday, it must be ARF/5-a-day over at Sweetnicks! Today, I am playing along with a nourishing soup that wraps you with comfort like a warm fuzzy scarf. Spinach and Mushrooms are quickly cooked into a simple soup. A little bit of butter, cheese and milk go a long way in making this soup taste rich and flavorful. It is fine to use fresh or frozen spinach in this recipe. I often find that mature spinach tastes gritty and unpleasant to me, so I am going with baby spinach which has a milder taste. 1. Heat butter in a large pot. Saute bayleaf, onions and garlic for a couple of minutes until transluscent. 2. Add the flour and stir it around to get it coated in butter. 3. Add 6 cups of water and bring it to a boil. 4. Now add mushrooms and spinach (it will wilt quickly) to the water and simmer for 3-4 minutes. 5. Fish out bay leaf from soup and discard. Using an immersion blender or a regular blender, process the veggies to a thick broth. 6. Season with salt, pepper, oregano and red pepper flakes, if using. 7. Finish the soup with milk and shredded cheese. Continue heating for a minute or two and then serve. am gonna try this one soon. I am an amateur Indian cook who drifted to your site through Sweetnicks. I have been "eating up" all the great tips and the alphabet. I've added you to my blogroll so that others can do the same! I love how easy this recipe is ... definitely will be trying it soon. Thanks for sharing! perhaps it would be tastier if you could use evaporated milk. That's what I use when making Mushroom Chicken soup. Hey Bilbo, it certainly is soup season where we both live! Hi Tina, I hope it works out well! Hi Sweetnicks, thanks for hosting! Hi Bhandaris, it really is worth trying for a quick easy supper. Strawberry, thanks for a great tip...evaporated milk would certainly make for a thicker creamier soup. 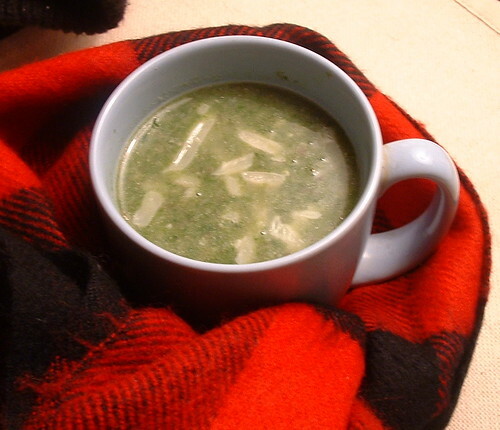 This soup not only looks great but tastes good too.Its nice to have it on a cold evening. do you have any recipes for diwaliche faral?